The Paceline Forum - Colnago Ovaltitan Info??? I acquired this Colnago Ovaltitan with a complete Dura Ace 7700 group about a week ago. I'm having a lot of trouble finding information about it or even assessing the value of the frame and fork (both are mint). Any information would be helpful. Are these the ones that were made in Russia? Can anyone elaborate? Let's just say that they were made by a subcontractor that was not located in Cambiago. 3rd gen Colnago titanium after the bi-titan(lots broke, round top tube) and then the next gen bi titan, square top tube, worked ok. These probably in the early to mid 90s..nice ride and made from Russian 5/3 or so titanium welded in Gorski, Russia by out of work defense industry ti welders(some of the vest best ti welders were Russian). If 7700 group, maybe 1997, since that's the first year of 7700. 'Value' is what ever the market will bear. Okay, here is my $.02 based off of casual observation when I was researching a Colnago Ti bike that I had (a MonoTitan). As others have pointed out, the Bi-Titan appeared first and is easily distinguishable by having "twin" downtubes. There were a couple of iterations of this model and they ran until about 1997. In 1998, the Bi-Titan was replaced by the "MonoTitan" which (true to its name) only had a single downtube (and it looked like a fat Cannondale downtube). These ran for about two years until it was replaced by the Oval Master (which is the formal name of the bike that you have). The Oval Master appeared around late 1999 and had the ovalized downtube (hence the name I would guess). It ran for about 2 years until it was replaced in the line-up by the CT1 (which had the carbon rear triangle mated to the titanium front). The CT1 was eventually replaced by the CT2. So, if you care to do more research on your bike, look up the name "OvalMaster". I'm sure that it will return more results than "OvalTitan". As a sidenote, the paint code for your bike is either AD10 or AD11 (my MonoTitan had the same paint scheme). The Ti tubes are rumored to have been produced in Russia with assembly taking place in an unnamed, Eastern bloc country and final paint and prep (yeah, right...) being done in Cambiago. The one that I had was a great bike but was replaced by a Moots. One of my riding buddies has an OvalMaster today and it has been his primary race bike for a number of years. I only read fictional books and believe in Santa Claus so nothing I have to add would be of value to you. Having read all this I am scratching my head trying to figure out what model is my newly acquired 'Nago Titanio. The bottom of the down tube is ovalized and the top tube has 'Nago club or Gilco shape. The seller wasn't of much help. Same paint job as the bike in OP, but nothing on the frame says "Ovaltitan" (or Ovaltine for that matter). Any idea? Thanks a lot. That my good friend is what is known as a "MonoTitan" due to the single (non-ovalized) downtube. Great frameset and it's perfect coupled to the steel, precisa fork. It is also the AD10 or AD11 (AD=Art Decor) paint scheme. I had the exact same bike in a size (Colnago) 57. It was paired with a Force carbon fork and was a wonderful ride. I believe I have a MonoTitan "equivalent", although it's unpainted and was purchased from my then-local dealer who had Russian connections. He had a sliver tested and it's 6/4 ti. O, and mine has a ti fork. Be glad to share pics if anyone's really that interested. I have a 1990's Colnago Ti something(?) . It has the paint stripped off of it and has Mexico stickers on it. I tell you, It's my favorite bike. It is supposed to be my "winter" bike but I ride it 90% of the year. I don't know much about it's history and I don't care too much about that. I love the way it rides and sometimes, I love the way I ride it. This is truly a frame that I feel I will keep forever. I always associate that name with the drink. Cool bike! That is a MonoTitan as well. The one that I had was bought as a winter/beater also. It became more than that, but was eventually sold to fund a Vamoots. Ya gotta love 50s/60s cheesecake advertising! 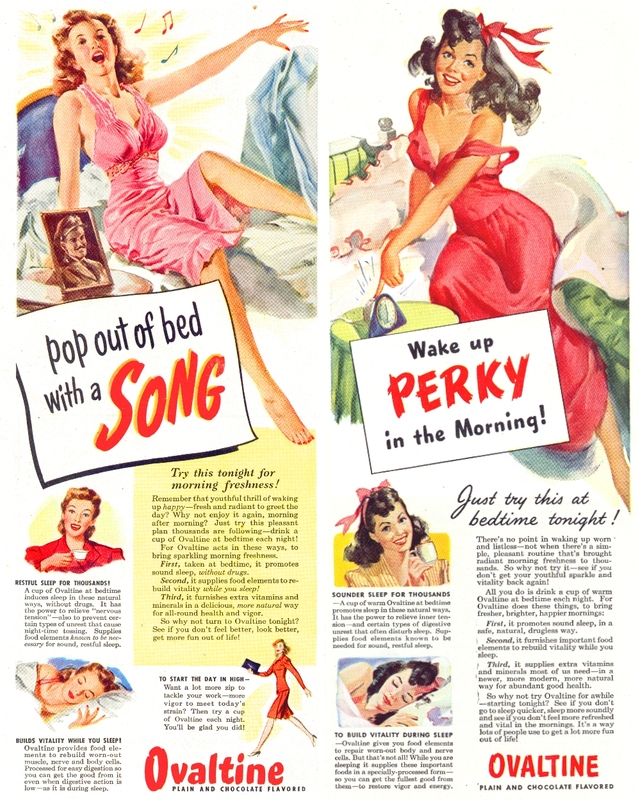 THAT would definitely make me wake up Perky in the Morning. Thank you very much. Any thoughts on this frame's compatibility with Colnago Street fork (carbon legs, aluminum steerer)? If I remember correctly, all of the Colnago forks have a 43 rake. Yes, I made sure to get a fork with a 1-inch steerer. Thank you again. You're an incredible resource of Colnago titanium frame information. One last (I think) question: would it ride better with a carbon Street fork or a steel Precisa? Thanks yet again.